If there is one thing most Mamas can universally agree upon, it is that they are tired. We can argue about breastfeeding vs bottle feeding, homeschool vs public school, electronics vs the real world or co-sleeping vs independent sleeping all day long but you bring up tired and everyone just nods their heads in understanding. There was once a time when there was nothing I could do to get more sleep. When Tenderhearted Boy was born within 2 months I knew my fate was sealed, my new life was that of a Mom zombie, he would not sleep more than a half hour at any time. Sleep training had worked wonders on my oldest but for my second born son it wasn’t helping whatsoever. Naps and all night long he would wake up and scream every half hour and I would go in again and again and again to comfort him back to sleep. I knew something was wrong but didn’t know what, except for one thing, I was exhausted. We tried acid reflux medication, switching him from breastfeeding to formula, anything to try to get him more comfortable but nothing worked. Every night that first year I was up every single half hour and on the morning of his first birthday I took dairy out of his diet. He slept through the night that very night, all the way through for 12 straight hours. As it turned out he had a huge intolerance to milk, once we discovered that his sleep issues were resolved overnight. I was finally getting good sleep again only one, wonderful problem, I was already pregnant with Wild Little Girl and months away from starting the whole newborn phase all over again! Thankfully she was a much better sleeper, we discovered her food intolerance early. Instead of all the mistakes I unknowingly made with my second born, this time I continued breastfeeding and removed her intolerant foods( from my diet. Even though she was a much easier baby she was still in fact a baby, so I was still exhausted. Once Wild Little Girl hit toddler hood we had our next big adventure to take as a family. Another, tiring but wonderful adventure, as my husband was approached by a few guys to start a company together. For the next year and a half he worked full-time at his regular job as well as part to full-time at his new job working towards owning his own company. I dove headfirst into this adventure right alongside him, after all it was a dream of his to accomplish owning his own business! We had figured we’d get around to that when our kids were older and we were you know, more mature if that was ever going to happen! God had other plans and that year my husband worked 6 day weeks, from early in the morning until late at night, he’d walk in the door and go straight to bed and start all over again the next morning. His only day off was Sunday, and I have a whole thing on how much of a day “off” Sunday is for Mom’s. I’ll be talking about that real soon! While my husband was busy accomplishing this huge dream for our family, I was at home managing our family as a single mom, temporarily. I learned a lot about what single moms feel like that year, God used it to grow my heart for them in a huge way! If you know a single mom, do something kind for her this week, will you? Eventually my husband’s new company became established and he was able to quit his full-time job, making his new company his full-time job. Enter great sigh of relief from me. I had my team-mate back again! Not rest yet because…. Of course! I’m pregnant again, with our much prayed for Rainbow baby. To say we were excited about adding our fourth baby to our family would have been a great understatement. We were thrilled! But I was tired. So there you have it! I’m sure many of you have stories like mine, one exhausting life event to the next. All exciting. All adventures. All worth it. But eventually you get worn out. Like really, super worn out. Now years later I am at a point where all my kids sleep through the night. There is no start-up company. No new babies on the way. Basically no reason for me not to be well rested. Now I am my own worst enemy as it relates to taking care of myself and getting a full night of sleep each night. Sure sometimes I go to bed on time. Most nights I am up late reveling in the quiet, watching one more show on Netflix, writing the next blog post or worst of all, mindless surfing on social media. I cannot even blame it on the dishes! I always try to get all those tasks done before my kids are in bed so I can enjoy that time, but to say I am using that time to my fullest advantage for rest is absolutely crazy. I stay up far too late and the next morning I find myself crabby and irritable. It’s hard for me to focus on the most simple things, not great considering I’m homeschooling my children! In the afternoon while reading aloud to my kids, I find myself drifting off to sleep mid sentence. Yet as soon as they are in bed I am full of energy ready to engage in things I want to do. God has been laying this word on my heart for months and it is the word I am the most afraid to tackle, it’s typically what I most fail at. I like to have something to show for my time even if it’s that I finished all the latest episode of Poldark, wrote a blog post, or finished reading a child a book but resting is not something I have mastered even one bit. I will be sharing this journey with you all as I figure out how to integrate rest into the life I am already living. Rest in homeschool. Rest in homemaking. Rest stealers, activities that seem like rest but actually aren’t. Ways I add rest and what ends up working well. I honestly only have a few things I do right now that cause me to feel real rest. I know if I truly dedicate myself to this, I can continue the commitments our family has already made to activities, church, family and homeschool with some creativity and motivation to make the best use of my 24 hours each day. We all have the same 24 hours, some of us are just more responsible than others and I lean more towards the irresponsible side. The thought of being “unproductive” is beyond scary to me as a Mom, however it’s time for me to become an Awesome Adult by giving myself the rest I need. My kids deserve it and so do I.
I know God is planning amazing things for our family through my year of Rest! If so, share in the comments below! I am another highly productive person, and God is teaching me to rest, too! Bless your heart! I can’t wait for my year of Rest. My word this year is Adventure, because everyday with my Squishy brings something new. I can either look at it as an adventure, or go crazy. Lol. Oh I just love that! Life with littles is truly an adventure every day, might as well embrace it! 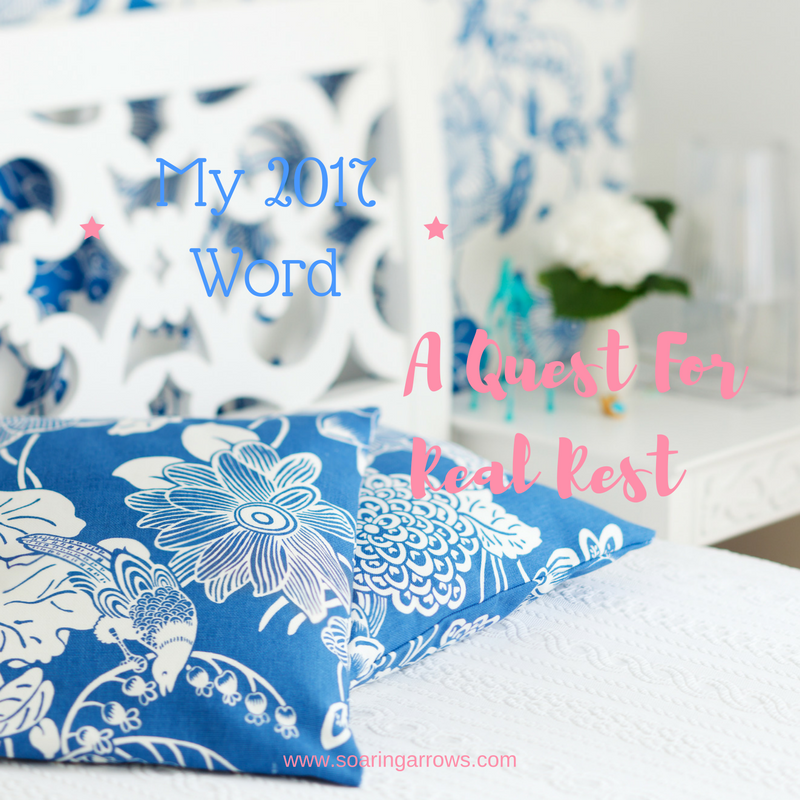 self care and rest for myself is one of my priorities for the year too! Love that! Hopefully we can learn from each other! I just ordered Rest Assured by Vicki Courtney and am so excited to read it. I also stay up too late! One of my resolutions is to have better sleep routines. Soft! What a great word to keep focused on! Love it. I love this! I definitely can identify with being tired. I was even getting tired of saying that I was tired. But with two babies born 17 months apart, I knew sleep would be hard to come by. I’m trying to focus on getting more rest this year too. I’ve gone so long without it and have felt the effects of it. My word for this year is…influence. When God first gave it to me, I was like really Lord? Ok. I’m challenged by it but I embrace it too. I feel like a lot of responsibility comes with a word like that. So…..I’m being more prayerful and intentional with words and actions….. I can see how God is honoring that. My main goal — simply to please Him. Angel I love your word! That is a big word but boy can God do a lot through you with a focus like that. I had my two middle kids 18 months apart so I can absolutely relate! So so exhausting when you are right in the middle of it. Now they are older and are the best of buddies which has been so rewarding! I am looking forward to sharing more on what God is doing through my year of rest but for now I have been….well resting! Once I feel like God has given me the green light to share, I will be all over it!